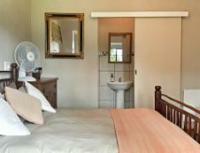 La Bastide is nestled at the foothills of the majestic Magaliesberg Mountains in the picturesque Skeerpoort Valley. Just minutes away from the Hartbeespoort Dam, our ‘country-style’ accommodation provides a peaceful, relaxing setting from which to explore the area. There is an abundance of activities available which include adventure sports, off road cycling, hiking, golf courses, ballooning, boat cruises, animal sanctuaries/rehabilitation, birding, wild life tours and many more. La Bastide is an ACCOMMODATION venue and does not have facilities for entertaining and hosting large parties for dinner/braaiing. There are however a number of venues nearby for dining and functions and large parties of people. La Bastide means 'The Country House' in French and this resonates with the quaint architecture and the wholesome environment. The guest rooms and self-catering cottages are adorned with handcrafted furniture and original art and are set within tranquil gardens that form a tribute to the plant and birdlife. The charming rooms and self-catering cottages are tastefully decorated, perfect for an overnight stay, weekend break or longer getaway. The year-round beauty of the surroundings makes La Bastide an attractive destination to spend winter evenings round the fireplace or summer days in the pool. We are also just a short drive away from all the major wedding venues in the area including Leopard Lodge, Green Leaves, Red Ivory, Pecan Manor and Die ou Pastorie. and offers very competitive pricing for such groups. There are a number of excellent restaurants within easy reach such as Die ou Pastorie, The Silver Orange and the Aviator, and many more within a ten minute drive . Stay between 27 Jan 2019 and 30 Nov 2019 and get 25% off. Valid every Mon,Tue,Wed,Thu. .
Stay between 07 Mar 2019 and 30 Nov 2019 and get 20% off. Valid every Fri,Sat. .
Our room was so beautifull an very neat and clean. It was a pleasure to stay there. It has everything you need. Gwen was so helpful and very friendly. It is so nice and peacefull with green gardens and a clean swimming pool! Will definately recommend it to anyone looking for a great place to stay. We had a wonderful experience, we were welcomed with the utmost friendliness and the rooms were extremely neat. Even better than on the photo's. Thank you Gwen! The place is absolutely clean, neat and comfortable and the architecture & location are certainly attractions on their own. Gwen has a very hospitable and warm character, which made our stay even more pleasant. I would definitely be back at La Bastide! Loved it and no improvements. Only stayed 1 night and was there for a wedding. La Bastide is 4.1km from the centre of Skeerpoort , the nearest airport 24.5km (Lanseria International Airport).